"Jewelry making is my life!" As an award-winning jewelry designer and art advocate, Jama Watts never rests. Her passion for creating art, as well as sharing the importance of the arts and handcrafted items, has made an impact, not just in her rural Kentucky community, but in the online handmade community as well. "Maybe it's more appropriate to say that art is my life, but jewelry is what keeps me going on a creative level. It pushes me beyond my bounds and allows me to have a career." Jama combines her background in painting and sculpture to create "wearable jewelry art." With her degree in Art (emphasis in Art History), Jama is constantly inspired by fellow artisans. Her designs unite the world of art with the natural world around her. Jama's featured design, The Desert Meets the Sea, was inspired simply by the packaging of her order from Fire Mountain Gems and Beads--"When I received my order, the turquoise and coral beads were lying right next to each other and that did it! I was very into dangles at the time, so I filled the bottom of the necklace with dangles and fringe and just let the piece lead me." 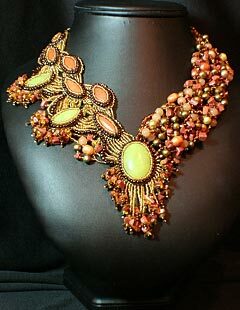 Jama entered this piece into the 2006 Fire Mountain Gems and Beads' beading contest and was selected as a finalist for the Jewelry Set category. 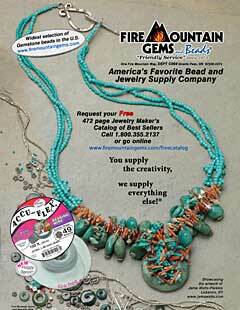 She was also selected to be a featured artist for the Fire Mountain Gems and Beads' back-cover advertisement in Step-by-Step Beads, January 2009. "I'm sure Amber, my daughter, will frequently remind me as she gets older that she's the one responsible for my career." As a painter and sculptor, Jama's doctor banned her from the art studio in 2002 when she was pregnant with Amber. She had nine months to immerse herself into a new creative medium. "I could have found solace in my colored pencils, but I think the whole 'get-out-of-your-studio-thing' was taken literally by my creative self. I ordered some beads, beading wire and inexpensive tools, picked up a few beading magazines and just started playing. I honestly figured it would be a hobby that would allow me to make gifts for friends and family, but as I found that I really enjoyed it, I started reading more about different techniques and wanted to try them. I've never even done that with my fine art background. I think part of it is due to not having any formal training in jewelry. Even though I don't subscribe to the standards that I was taught in college with my paintings or sculpture, there's still that 'this is the way it should be done' feeling that tugs at me. With jewelry, I feel free." Jama opened a gallery in 2004, These Precious Things, to showcase her artisan jewelry and original art work, along with the works of a few dozen local artists. Her gallery is dedicated to educating and promoting art within her local community. The gallery has since turned into a community coffee bar/gallery, offering music, gourmet coffee and wireless internet, along with a variety of local art. "It was a lot of blood, sweat and tears! I found an investment company that worked with me to obtain a small business loan. I got really lucky in opening my gallery. My mother owns a building which has three store fronts and she allowed me to use one of the stores. Friends and family helped me rip up carpet and tile, paint, run electrical wiring, etc. It's still a day to day operation, and I don't pull a paycheck, but giving these artists exposure and introducing the local community to the arts is really important to me." In order to promote her gallery and art, Jama increased her online marketing efforts. 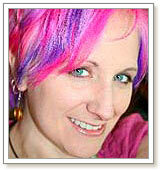 In July of 2008, she opened an Etsy store, thesepreciousthings.etsy.com, and joined Etsy street teams. "My work is very much a reflection of what I'm into the moment I make the piece. I'm very ADD (attention deficit disorder) when it comes to my craft, constantly learning new techniques and playing with the results." Ramblings of an ADD Jewelry Designer is a blog Jama started to help her track her creative thought process and to create awareness for her artwork and gallery. "I have a fan page for my Etsy store on Facebook, maintain my jewelry blog and utilize Twitter to announce updates and sales." Jama has been recognized in numerous beading contests, including Fire Mountain Gems and Beads and Bead Dreams, while gaining recognition in the beading industry. She travels throughout Kentucky, participating in craft fairs and festivals. To bring people to the gallery, Jama keeps the Tourism and Chamber offices stocked with brochures, and promotes sales events through postcard mailings and local newspaper advertising. Jama has been featured in Bead and Button magazine, Fire Mountain Gems and Beads' catalogs, back-cover advertisements and on several vendors' websites. She has also been on HGTV's "That's Clever!" Even with such successes, Jama continues to push herself to the next level by setting goals. "I would love to locate my pieces into other galleries across Kentucky and the United States. I had two pieces in an opening in New York City in 2008, meaning that I attained one of my goals, but I'd love to have my work there on a regular basis, in boutiques or galleries. Another goal is to write instructions for some of my smaller pieces and submit them to beading publications. I've had pieces published, but I haven't been published as an author, as of yet." Although Lebanon, Kentucky does not currently have local beading societies, Jama does belong to online groups, such as Etsy BeadWeavers. Through this group, beadweavers from around the world connect, answer questions and talk about techniques. "One of the best things this group has done for me is the monthly challenge. An artist will come up with a theme and we have a month to create a piece related to that theme. This pushes me to focus on one theme, create a new design and have a deadline to create an extravagant piece." Jama, along with other designer-artists from the Etsy BeadWeavers' team, created one-inch beaded squares and donated them to Jeanette Shanigan's Bead-It-Forward beaded quilts project. The beaded quilts were auctioned at the 2009 Bead and Button Show in Milwaukee, Wisconsin to raise money for breast cancer research and awareness. Jama is also heavily involved in local organizations to help her community grow. By creating cancer awareness bracelets and donating jewelry and art to auctions such as the Bluegrass United Way, Lexington Art League and the local Arts and Humanities Council, Jama is able to contribute to causes close to her heart. "I believe the arts are important in education and, living in a small, rural community, I also believe that the arts must be promoted as a necessary component of education and enhancement to our lives. With the Arts Humanities Council, we host art hops to promote local artists, art auctions to raise operating funds, host an annual arts festival, give grants to local projects and host an annual arts summer camp for children." As a member of the Chamber's Board of Directors and the Main Street Committee, Jama plays a large role in the development of her community. "We have a beautiful historic downtown here in Lebanon and I want to see it prosper, so my daughter and her friends can grow up with a great education and culture, and possibly maintain residence as they have families of their own." "Push yourself and your creative limits! It's easy to find something and stick with it, or even to get in a rut. Pushing and testing yourself will force you to find what it is you actually want to do. If you keep pushing yourself, you'll find out that you are capable of doing more than you dreamed of!" View more of Jama's jewelry art in the Gallery of Designs, or visit her website at www.jamawatts.com for other original art pieces and artisan jewelry.